5k races have become the most popular road racing distance because they offer something for everyone. Completing the 3.1-mile distance is a great goal for novice runners and covering it with sustained speed is a challenge for more advanced runners. 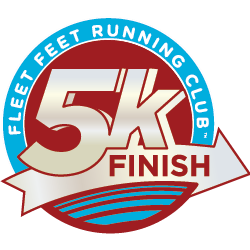 Fleet Feet Running Club offers two, 10-week 5K Training programs. Our 5k Finish program (formerly, No Boundaries) is designed for the true beginner and our 5k Fast is intended for the runner who has transitioned from completer to competer. Why join our 5k programs? PROVEN: We've helped thousands of athletes complete their first or fastest 5k. Our post-program surveyors typically report that 100% of participants improved their fitness level, more than 90% achieved their personal goals, and - on average - they awarded the program 4-1/2 out of 5 stars. PROFESSIONAL: Our degreed and credentialed head coaches have decades of experience in professional performance coaching. SAFE: We take pride in helping participants gradually and safely improve their fitness levels. Our mission is to help team members move more comfortably and perform better at every athletic stage of their training journey. EXTRAS: Participants receive in-store discounts at Fleet Feet, a graduation celebration, and more! The 5k Finish program is a learn to walk, run/walk or run program designed for the true beginner. During this 8-10 week program, participants are surrounded by a team of dedicated, motivated people all working toward the goal of becoming healthy and strong. By the time they cross the finish line of their goal 5k race, team members will have learned the importance of proper form, stretching, hydration, and nutrition - all the tools needed to maintain their new fitness routine. Our 5k Fast program is for experienced runners who have made the transition from completing to competing and who have been following a structured training program for at least one year. Training initiatives include stride efficiency, 5k-specific "fast-twitch" endurance, aerobic endurance, versatile race pace efficiency, and post-run recovery and injury prevention. Our Spring 5k Finish program will begin with a kickoff meeting on April 20th at 7:00am at our Des Peres store. Our Summer 5k Finish program will begin with a kickoff meeting on July 7th at 6:30pm at our Des Peres store. 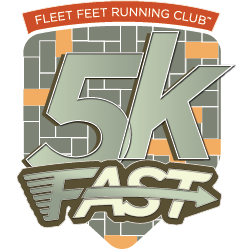 Our Summer 5k Fast program will begin with a kickoff meeting on July 7th at 5:30pm at our Des Peres store. Our 5k Finish programs train Wednesday evenings and Saturday morning. Our 5k Fast programs meet Tuesday evenings and Sunday mornings. If you are an Active-level member of Fleet Feet Running Club (FFRC), we invite you to pass the time before your program begins by joining us for our Thursday evening and Sunday morning social runs. If you are not yet an Active member, we hope you will register and then join us. Among other benefits, Active FFRC members receive a discount on training programs. To become an Active member, click here. To register for the Spring 5k Finish, click here. To register for the Summer 5k Finish, click here. To register for the Summer 5k Fast, click here. 5k Training Cost: Active-level club members receive a 15% discount.